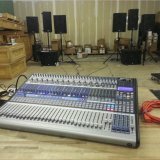 Disconnect your StudioLive-AI mixer or any other Firestudio device. On Windows 7, click on the START menu in the lower left hand corner of the screen and click Control Panel. On Windows 8, move the mouse into the upper right hand corner of the screen and then click on the Search icon (magnifying glass). In the Search field, type Control Panel and then click on the Control Panel shortcut in the list on the left. Find Universal Control AI in the list of Programs and select it. Now lets make sure the Roaming folder is cleaned up. On Windows 7, click the START menu in the lower left hand corner of the screen. In the search field, type %appdata% and hit enter on your keyboard. On Windows 8, move the mouse into the upper right hand corner of the screen and then click on the Search icon (magnifying glass). In the search field, type %appdata% and hit enter on your keyboard. This will take you to the Roaming folder. Open the PreSonus folder and delete the Universal Control AI folder located there. Once your computer has rebooted, connect your StudioLive-AI. When your interface has synced with your computer, it is ready for use.